When Inhak Kim started working with the Enrollment Information Services’ Academic Data Management team, he visited Knowledge Navigator up to 50 times a day to help him with his data analyst job. When it comes to defining a chocolate chip cookie, Helen B. Garrett, the University registrar and chief officer of enrollment information services, can tell you that even Google can’t land anywhere near to a single definition. Google “What is a chocolate chip cookie?” and you’ll get 95 million search results, including an article that claims some chocolate chip cookies don’t even have chocolate chips. More than ever, key institutional decisions in higher education are driven by data, and that’s true for someone like Garrett, who has to deeply understand the makeup of the student body at the UW to help her and other decision-makers map the future of the University. If the UW wants to attract and retain the best students, for example, increase diversity and position itself for the future, it needs accurate data to understand enrollment trends, retention and graduation statistics — and who these students are. This is where Knowledge Navigator comes in. The tool, developed by UW-IT’s Enterprise Information, Integration & Analytics (EIIA) team, creates a common language we can all use and we can all understand. “Think about the term ‘first-time student.’ How do you define it? As with chocolate chip cookies, everyone across the UW has different definitions,” Garrett said — which can cause confusion. Without a consensus on what a first-time student is, tracking trends or gaining a holistic picture of first-time students across majors and over time is difficult. That’s why first-time student has to be defined consistently, and that definition needs to be understood and easily available to all users — whether that person is the registrar, a dean, the president or anyone else at the UW. Without a common definition, there is no way to accurately tell how many first-time students attend the University today or how that number has been changing over time, explained Garrett, who has a doctorate in education and started working at the UW in early 2016 with the expectation that she would be heavily involved in the strategic development, implementation and management of student information systems. “If we are trying to meet strategic enrollment goals, such as attracting more first-time students who are also the first in their family to go to college,” she said, it is important for everyone to agree on what those terms mean. It is the basis for accurate data that can be used across the institution. “We can’t throw caution to the wind and assume everyone will use a term the same way,” she said. In Knowledge Navigator, an easy search brings up the business term for “first-time” student, as well as four other terms with “first-time” that have different definitions. No one needs to guess (or argue) about their meaning. They are now part of a standardized, agreed-upon institutional knowledge set. Knowledge Navigator is doing the same for other areas of the University, including finance and research, among others. “You need to have a shared vocabulary to give people a fighting chance to talk about the same thing, and we need to agree on the meaning of a term such as ‘first-time student,’” Garrett said. A shared vocabulary is the foundation for accurate data. “Knowledge Navigator is helping us build that foundation,” she said. 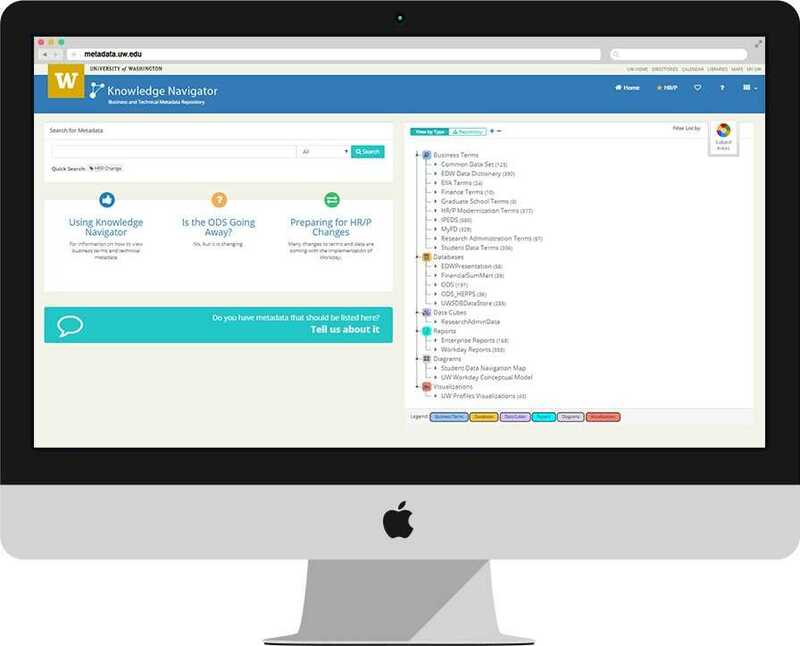 Knowledge Navigator was unveiled in 2016 in part to ease the University’s transition to Workday, the UW’s new human resources, payroll and benefits system. Workday brought its own terms and definitions, so Knowledge Navigator acted as a bridge to help staff understand changes between old and new HR/payroll data. Today, Knowledge Navigator has expanded its reach to other areas, and incorporated information from student groups, research administration, the Graduate School and others, to create a one-stop shop for information about data, glossaries and definitions that have been vetted and agreed upon by key stakeholders across all three campuses. What is an employee? What is an organization versus an academic organization? You can get the definitions in Knowledge Navigator, the tool managed by EIIA. Knowledge Navigator is part of an ecosystem of data analytics and reporting designed to improve decision-making at the UW, with EIIA at the forefront of these efforts. The team manages the Enterprise Data Warehouse (EDW), the central repository for the UW’s current and historical institutional data, which includes information used for planning, managing and operating the University. Your UW NetID opens the door to Knowledge Navigator, and to standardized, agreed-upon institutional knowledge. Knowledge Navigator works in concert with other tools managed by the EIIA team to make it easier for the UW community to work with EDW data. Soon, the tools will include Enterprise Web Services, which enables developers to integrate applications and departmental systems with UW business systems. It is also the starting point for finding the right data visualizations in UW Profiles, a set of web-based dashboards that helps users easily access, explore and understand basic University data, such as student enrollment trends. The beauty of Knowledge Navigator is that it brings together a diverse group of UW stakeholders from across the University to work together to agree on the definition of a term or description before it becomes part of the tool’s glossary, said Keith Van Eaton, the metadata manager for the EDW, EIIA and the UW. Van Eaton manages the vetting and approval process for institutional terms and works closely with stakeholders from six administrative areas. One of them is the Student Term Vetting Group (STVG), the most active in creating fully defined terms and definitions — an average of about 10 per month and counting. Garrett, as data custodian for the group, reviews and approves the information that makes it into Knowledge Navigator. 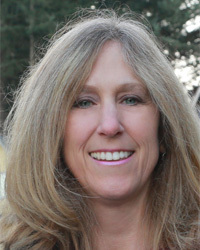 In her previous position, Garrett helped Lane Community College in Eugene, Ore., transition from a legacy system to a new management system for student data. That experience shaped the value of having common data standards and even proper abbreviations that everyone could agree on. That’s because new terms make it into the lexicon all the time. Consider Direct to College admission, a new admission process in the College of Engineering that assures incoming 2018 freshman students who have been accepted into the program will be able to pursue an engineering degree at the UW. The term “Direct to College” is so new you won’t find it in Knowledge Navigator — but you will soon. At some point, someone at the UW will want to know how many students are being admitted in this manner, and if any are first-time students, Garrett said. At first glance, Knowledge Navigator may seem like a tool strictly for data analysts looking for the definition of business terms. But it is more than that, Garrett said. The tool is a great way to help new employees learn about the UW, she said, and cites as an example a new staff member on the Enrollment Information Services’ Academic Data Management team. The position provides data reporting to Garrett’s office, other units in Enrollment Management, and the University, in general. 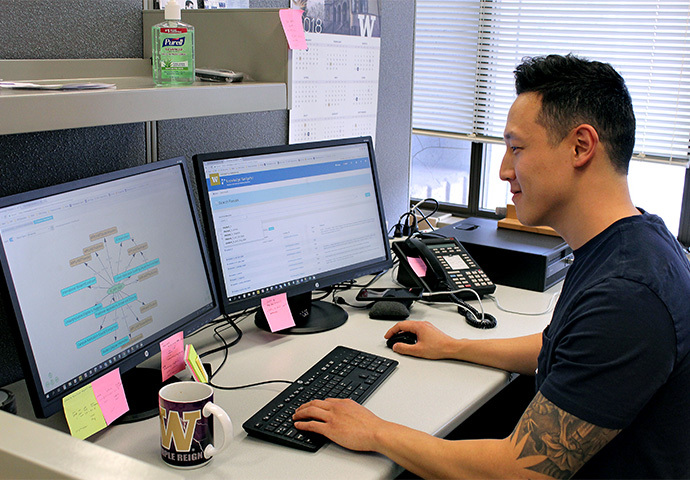 “Inhak Kim lived in Knowledge Navigator during his first three months at the UW. It helped him to better understand how things work here,” she said. Kim, a report analyst, agreed. “When I started here, I probably went to Knowledge Navigator 50 times a day! With this tool, I can relate terms to one another. If I see a term in a report that I don’t understand, I can look it up,” he said. With Finance Transformation on the horizon, there’s already a group working on finance terms for Knowledge Navigator. Research administration and the Graduate School also have their own vetting teams. A University Advancement team is in the plans as well. Use your UW NetID to sign in to Knowledge Navigator. Do you have any definitions, terms or other information that should be listed in Knowledge Navigator? Send an email to help@uw.edu. Learn more about business systems at the UW and how UW-IT contributes. Check out how UW-IT will provide critical support to UW business systems during 2019.